A fight for survival in the Canadian wilderness. What is it? A survival game set in the Canadian wilderness. A geomagnetic anomaly has plunged the world into darkness and rendered all technology useless, including the plane you were flying over the vast, frozen wilds of Canada. You awake surrounded by flames and wreckage—badly injured and freezing to death—and find yourself in a battle to survive in one of the most inhospitable corners of the planet. It’s a hell of a place to spend the apocalypse, and death lingers around every corner of this deadly, wintry expanse. There are two distinct ways to play The Long Dark. There’s Wintermute, an episodic story mode that follows bush pilot Will Mackenzie as he searches for his missing friend. This is a linear experience with stylish, melancholy cutscenes exploring his past and the state of the world. Then there’s Sandbox, which lets you tell your own stories and explore at your leisure. The only objective here is surviving for as long as possible, and how you do that is left to you. Wintermute is a good place to start. It begins with a series of tutorials designed to drip-feed the game’s systems to you. You’ll learn about treating wounds, foraging for medicinal plants, building fires, and other essential survival skills. And you’re subtly guided from one moment to the next, which means you’ll rarely get lost. Sometimes you’ll meet survivors who need your help, forcing you to complete a series of thinly-veiled fetch quests, which grind the story to a halt and feel a little too much like busywork at times. But it’s in Sandbox mode where The Long Dark’s survival knife is sharpest. Having the freedom to explore and travel between its large, interconnected regions is more compelling than following a prescribed path. Choosing how you spend each day is more engaging than ticking off objectives. This freedom, and dynamic, unpredictable elements such as the weather, make every Sandbox game fertile ground for emergent storytelling. 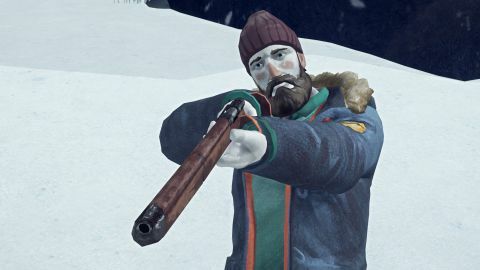 Some of my most vivid memories of The Long Dark weren't created by the developers, but emerged naturally. I remember the unbearable tension of being on the edge of starvation, one bullet in my rifle, and a skittish deer in my sights. Cowering in a cave at night, campfire about to burn out, listening to wolves howling outside. Limping half-dead and hypothermic through a blizzard, only to see the silhouette of a life-saving shelter through the wall of snow. Wildlife is a frequent nuisance. Wolves will catch your scent and stalk you, and if they attack you’ll almost certainly be left with serious wounds. Honestly, they’re miserable to deal with, spoiling the pensive mood of the game. Surviving the elements is far more interesting to me, and I’m glad there’s a difficulty mode in Sandbox that disables animal attacks. But in story mode you have no choice but to deal with them, and they’re a real thorn in your side. The weather is constantly in turmoil, which can change the mood of the game—and your fortunes—in an instant. One minute it’s a crisp, clear day with piercing blue skies. The next a stormfront is rolling in, wind blowing the falling snow so hard it moves horizontally. Watercolour skies shift from a blanket of looming grey to the dusky pink of early evening, painting the snowfields around you in vivid colours. It’s an incredibly atmospheric game, with a hand-painted art style that lends it a peculiar, ethereal beauty, despite how gruelling it is. Like a lot of survival games, everything in The Long Dark boils down to managing a series of perpetually dwindling meters. Hunger, thirst, tiredness etc. But thanks to the elegant design of the simulation, and a slick, minimal UI, it’s not a game where you feel like you spend half your time buried in menus. The abundance of progress bars is slightly disappointing, however. Many actions, such as breaking a branch down for firewood or cooking food, happen off-screen, illustrated by a slowly filling circle. I would have liked to see my character interacting with the world a little more directly. There are only a handful of really great survival games on PC, and this is one of them. The story mode has its moments, and does a decent job of telling you how the game works, but it’s when you’re creating your own stories in the sandbox that The Long Dark is at its most absorbing. Beautiful art direction and rich, nuanced sound design bring the deep forests, frozen lakes, and ragged mountains of the Canadian wilderness to life. And your endless struggle to keep the Grim Reaper at arm’s length is enormously rewarding, providing you have the patience to appreciate its slow, measured pace.